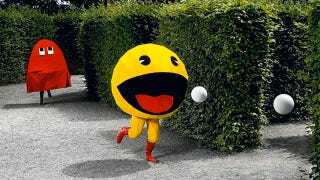 I admit it's really strange to see Pac-Man with legs, but I love this picture nonetheless. All of these photos, shot by German photographer Patrick Runte, are wonderful depictions of what it might be like if classic video games were brought to life in the real world. The Pong one is especially bizarre (and cool).